Players with wheelchair basketball team Lothian Phoenix are gearing up for the annual Scottish Cup Final against great rivals, West of Scotland Warriors. It will be the fifth annual match between the two, and the title is always hotly contested, with Warriors as the current holders. The match will take place on Saturday 31st January at 3pm at the Lagoon Leisure Centre in Paisley. Lothian Phoenix are enjoying a successful season so far – the first in which they have been sponsored by Edinburgh based charity, Blackwood. 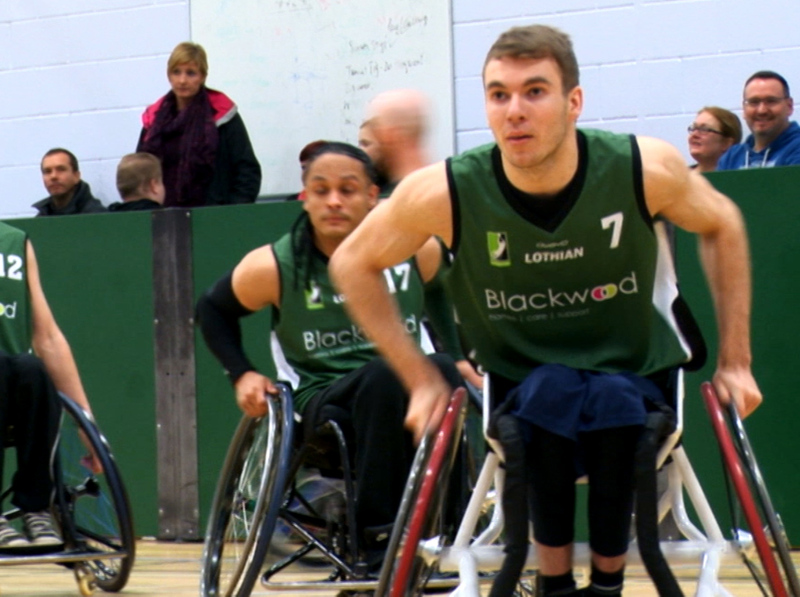 The West Lothian team has won half of its games played so far in the British Wheelchair Basketball League. In a further testament to the team’s success, Lothian Phoenix were also promoted to Division 1 North this season and are aiming to achieve 3rd position in the league. Formed in 2006, the club enables individuals with physical disabilities the opportunity to participate in a competitive sport. The team is coached by Tina Gordon who has been involved in the sport for more than 35 years. Tina is excited for the cup final match and is also thankful to have Blackwood sponsor the team. She said: “We are very much excited for the big game and are rigorously training in preparation. To have such a respected housing and care provider support us is fantastic. “The team could not be more grateful for the new kit which has been great to play in throughout the season. Lothian Phoenix has a real family feel to the club from our junior development programme through to senior division one squad. The team also has a long running history of international sporting success – with many of its players achieving top accolades within the sport. Steven Ross, the current point guard has played for GB U23s at various European Championships whilst Robyn Love has just been selected to represent GB Women at a tournament in Japan. The team also hosts veteran GB Paralympians – Sarah Baillie and Calum Gordon, both of whom have many European, World and Paralympic championships between them including a silver medal for Calum in Atlanta in 1996. Colleen Robertson, Communications and Marketing Manager for Blackwood, is delighted the team has had such a successful run this season which has been helped by the sponsorship. She said: “We’re delighted to be the official sponsor for Lothian Phoenix and we are thrilled to be attending the cup final. We can’t wait for the big day – and to cheer on the team from the sidelines. “Here at Blackwood we try to encompass innovation with care and the team are definitely first-hand examples of this. “Lothian Phoenix represents a team of opportunity – the players have overcome adversity to achieve something truly spectacular and we could not be more proud to support them. Blackwood’s home grown social media platform, bespoken, has recently expanded to 120 countries worldwide and regularly features the latest in care-design – including contemporary designs – such as sports wheelchairs. Users include people with disabilities, relatives and carers as well as specialists who develop disability aids. Bespoken provides a forum where they share, showcase and discuss cutting edge technologies and designs that can help to improve the quality of life for those with disabilities or impairments. With 1500 properties all across Scotland, Blackwood’s experts are also called in to implement innovative solutions such as rise and fall kitchens and specialist flooring which can sense when someone falls. Blackwood Homes provides a range of accessible, modern, attractive and bespoke housing aimed at providing great value to people with a range of disabilities and housing needs.